It's Real Diaper Week, April 16-21st and the focus is advocacy and education. You might be thinking, "Uggg, sounds like work!" or "How can I advocate if I am a stay-at-home mom and I don't get out much?" Well the truth is, advocacy is easy! The first place I ever learned of the existence of modern cloth diapers it was just by seeing pictures of babies wearing them on a message board online. Just seeing them in their cute little diapers got the wheels turning in my mind. Essentially every picture of your little ones in a cloth diaper is advocating cloth diaper use, even when you're not trying. The same goes for when you get the opportunity to show off your child's cloth diaper when you're out. Changing your baby's diaper at a playground or elsewhere, make eye contact and start up a conversation, I guarantee you someone has their eye on that diaper! The truth is, cloth diaper advocacy can take place without even a word being spoken. Just showing off the cloth diaper or cloth diapered baby exposes outsiders to the existence of modern cloth diapers and could peak their curiosity enough that they might go home and google it. So, let's ask again. 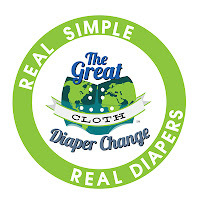 Have you advocated cloth diapers today?